With almost 50,000 fast food chains across the United States it's quick and easy to grab food on the go. Find some ways to eat a well-balanced, nutritious meal at a fast food restaurant with these titles from our digital collections. Spurlocks social experiment in fast food gastronomy sees him attempting to subsist uniquely on food from McDonald's menu for an entire month. He also examines the corporate giant's role in contributing to America's obesity epidemic. "Schlosser has a flair for dazzling scene-setting and an arsenal of startling facts . 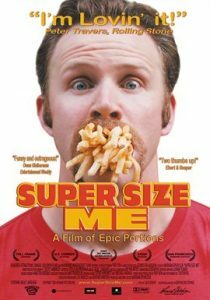 . . Fast Food Nation points the way but, to resurrect an old fast food slogan, the choice is yours. "—Los Angeles Times. 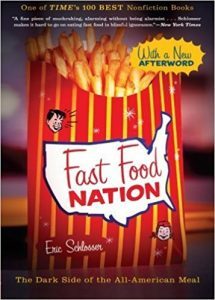 In 2001, Fast Food Nation was published to critical acclaim and became an international bestseller. Eric Schlosser's exposé revealed how the fast food industry has altered the landscape of America, widened the gap between rich and poor, fueled an epidemic of obesity, and transformed food production throughout the world. The book changed the way millions of people think about what they eat and helped to launch today's food movement. Congratulations! If you're a connoisseur of fast food, consider this to be your fast food yearbook, allowing you to look back at many of the salty, fatty, and/or sugary menu items you may have passed through your digestive system, but in a non-artery clogging and non-blood pressure raising way...unless you're eating fast food while reading this. 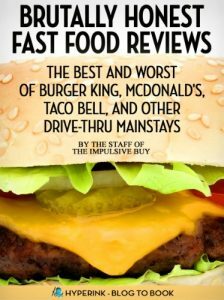 There are dozens of reviews in this book, mostly from fast food behemoths, like McDonald's, Subway, and Taco Bell, but there are also reviews from medium-sized fast food chains, like Jack in the Box and Dunkin' Donuts, and from smaller chains, like Carl's Jr. and Whataburger. Most of the products reviewed can still be found on fast food menu boards, or in the McDonald's McRib's case it comes back every so often for a limited time, but some are buried in the discontinued fast food graveyard, never to be consumed again. These fast food reviews were originally posted on our blog, The Impulsive Buy (theimpulsivebuy.com), which is one of the internet's premier websites for junk and fast food reviews. Actually, we're not 100 percent sure the last part of the previous sentence is true, but our cumulative blood pressure and cholesterol levels make us feel like we are. 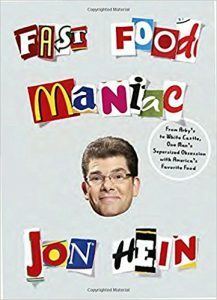 Jon Hein is the ultimate fast food maniac, and in this book he draws on his extensive knowledge of, and love for, both nationwide chains and regional gems, from McDonald's and KFC to In-N-Out Burger and Carvel. He digs into their origin stories; reveals secret menu items; includes best lists for everything from fried chicken and shakes to connoisseur concerns such as straws and biscuits; takes a nostalgic look back at the best giveaways, slogans, and uniforms; and even provides a battle-tested drive-thru strategy. With behind-the-counter looks at places like the Dunkin' Donuts headquarters and Nathan's original hot dog stand, Fast Food Maniac is the definitive, cross-country guide to some of America's best-loved guilty pleasures.